Location: From Edmonton take Highway 2 South to Leduc. Take the Highway 39 exit West (towards Drayton Valley). Turn left at Alton Drive and proceed to the second 4-way stop. Turn left onto Black Gold Drive (Now you are driving South East). Turn right at the entrance to Leduc Golf Club. 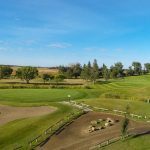 The Leduc Golf Club is a semi-private facility that welcomes the public to enjoy both the golf course and our excellent dining room, known as Leduc Cook House. 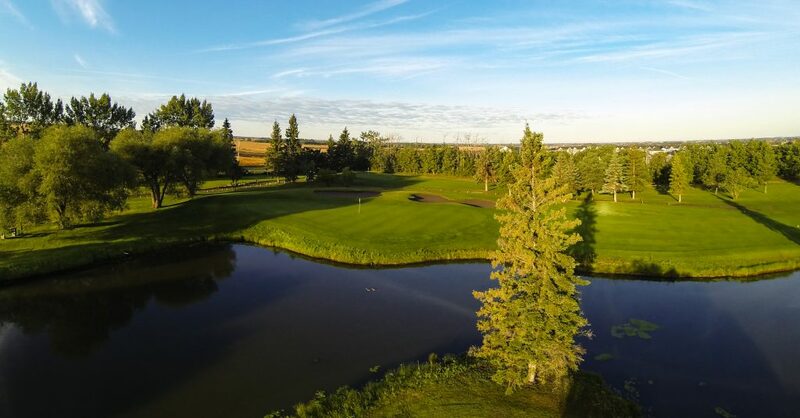 Leduc Golf Club began as a nine hole course in 1961. Over the years it has undergone a number of changes and has evolved into a challenging eighteen hole test of your golfing prowess. The course is a Par 71 and boasts more than 6,600 yards of fairways. In addition, the layout provides an easy walking course with plenty of eye-pleasing scenery. Golf Course: The front nine features tree lined fairways and several water hazards to test your skill. On the back nine the golfer will encounter fewer trees but more water hazards in the form of several large ponds and creeks that intersect the fairways. Upon reaching the bent grass greens, the golfer’s putting skills will be taxed with subtle breaks and slopes on all the greens. 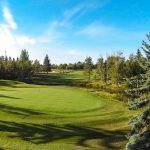 Food & Beverage: Leduc Golf Club welcomes the public to enjoy both the golf course and our excellent food service. The layout of this facility, provides plenty of eye-pleasing scenery to enjoy as you relax or socialize with friends at a golf tournament, corporate event, wedding, or private function. The clubhouse is available in the off season for private bookings. Weddings: If you’re looking for an outdoor wedding ceremony, look no further. We have a spectacular location at Leduc Golf Club for an outdoor ceremony. After you say “I do” you can take your pictures on the golf course, while your guests enjoy a Champagne Reception. Once pictures are done, rejoin your guests for a beautiful dinner and reception. The Leduc Clubhouse will accommodate up to 120 people for a wedding. Our facilities are fully air-conditioned and can be decorated beautifully to suit your taste. 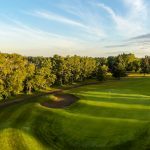 The Leduc Golf Club may be an old Edmonton-area track but the pro shop is putting a new face on it this year with some changes, both in its public persona and in its playability. James Whitton, the club’s Head Golf Professional, said the biggest difference and one that began last year, is making the general public feel more welcome at his course, a tree-lined, easily walkable 18 holes that while relatively flat still makes you use every stick in your bag. 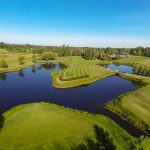 In describing the offers that will be forthcoming this year, Whiten said they now “use a seven-day rotational special,” to entice players out to Leduc, where the course is located on the south end of the city. 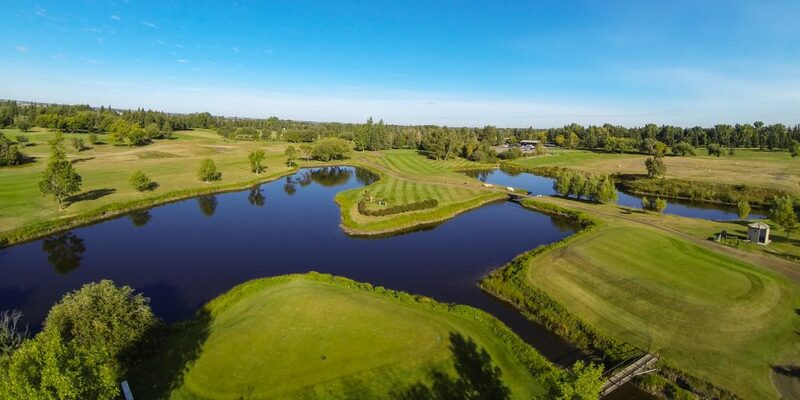 Once people tee it up at the Leduc Golf Club, they’ll find that while the design isn’t over-the-top tough, it can be a challenging one considering 13 of the holes have water on them. The front nine is tree-lined and stately in its aging majesty. The back nine is more open but at the same time that’s tempered by more water coming into play. There have been a couple of changes to the layout over the past while, including removing some trouble spots for the average player. 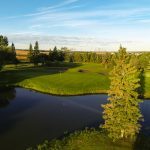 In regard to the special offers the Leduc Golf Club will tee up this year, that can be taken advantage of by booking online, the pro explained them this way: “Things like Date Night Friday, where two golfers can get a cart, two drinks and an appetizer for $75 after 5 p.m.; we do a weekend 2-for-1 for green fees on a great course to walk from 2 p.m. (carts are full price at that time); and we have a little ceramic dog, Spot, out on the golf course where you can take a selfie and put it up online, just to make it a little more entertaining,” as they look to capture new players through today’s trend toward using social media in all forms. While the course harkens back to its roots in the 1960s, that doesn’t mean it looks like something from that time. 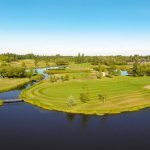 The conditions at the Leduc Golf Club are always superb with lush fairways, thick rough and greens that run fast and true. And that’s even more true this year with some new equipment to tend to the putting surfaces with. In order for his course to reach one of the goals set, to be seen and played by more people this year, Whitten emphasized how anxious they are to open up their arms and greet newcomers to their playground. For tee times at the Leduc Golf & Country Cub, go to playgolfalberta.com.